It really blew me away when Sullivan came out with Elivs and said,"This is a real decent lad. "after he moved his hips like he did on Sullivan last show. Wow! To this day, I think Señor Wences rocks. His line was co-opted by Hanna Barbera for the end of Quick Draw McGraw when Ba Ba Looie falls off the back of the stage coach and lands in a strong box that has also fallen. Quick Draw shouts "are you alright", Ba Ba Looie raises the lid and says "S'alright"
I agree with you, kluv42, about Topo Gigio. But I kinda liked Señor Wences. To this day, you'll hear me going, "S'alright? S'alright!" Most of the other variety acts I liked, too... 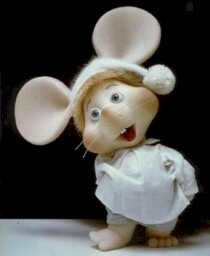 The rock-n-roll bands were kinda okay... but I HATED Topo Gigio! 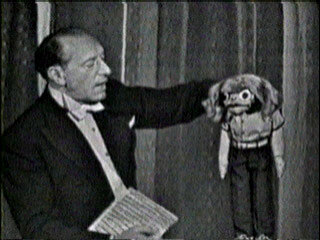 Not far behind on my dislike list was Senor Wences, the ventriloquist. Those guys were both reasons to go do something else for awhile and come back later to see if anything interesting was on. when Jim Morrison with the Doors were to go on Sullivan, doing "Light My Fire", a prduction aide spoke to Jim before he went on...saying...uh, could you say "girl, we couldn't get much better,? HuH instead of cwe couldn't get much higher...can you do that? So Jim looked at the guy....this was live TV then...came out and sang the original lyric...so now he was told, "You'll never do Sullivan again"... jim said. "I just did"
I am with you Katbear, I only watched Ed Sullivan for Topo Gigio too. To heck with the Beatles. Topo Gigio was my favorite part of Ed's show. Forget the Beatles... I loved Topo!